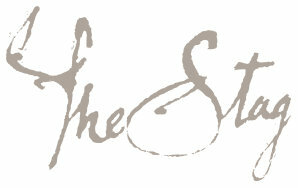 Welcome to The Stag where you will find a friendly and relaxing atmosphere. Hot pudding with a toffee topping. Served with cream or custard. Melt in your mouth Chocolate Pudding with a soft gooey centre. Apple Pie on a pastry base topped with Caramel. Creamy dairy ice cream rippled with raspberry compote and strawberry pieces and sprinkled with crisp meringue pieces. On white or granary bread served with salad garnish and kettle chips. A tortilla wrap with lettuce, mayo & crispy chicken breast. Served with a salad garnish. Ham, cheese, pickled onions, crusted bread, pickles, coleslaw with salad.